If you’re looking to create your wedding song list for your upcoming reception, you have countless choices, including traditional favorites and modern tunes that are suddenly making a bold and loud appearance as the bride and groom lead their guests out onto the dance floor. If you need a little help deciding which wedding songs to pick, here’s a look at what’s trending for 2015 into 2016. An alternative rock band, Coldplay released “A Sky Full of Stars” on its sixth studio album (“Ghost Stories”). The song’s lyrics take you along a journey of strong emotion that is filled with hope and intense love. A folk rock band, the Lumineers released “Ho Hey” on their first album, which has the same name as their band. It’s the perfect song for a couple of “sweethearts,” and has been gaining in popularity for wedding use. An American singer and songwriter, Bruno Mars is featured on the fourth studio album released by Mark Ronson, an English musician and producer. The song is wildly popular and has been embraced by everyone from eight-year-olds to senior citizens. 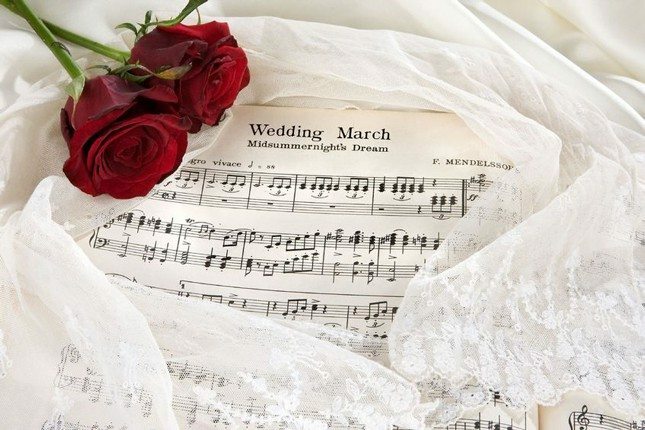 Traditional favorites are still hot as ever for wedding songs. You’ll find more of these interspersed throughout most wedding events, probably because most of them have everything you need to get folks up onto the dance floor, including hot notes and even hotter lyrics. Songs that many wedding guests are still going to expect to hear at 2015 weddings include “It’s Raining Men” by the Weather Girls, “We Are family” by Sister Sledge, “1999” by Prince, “Boogie Oogie Oogie” by A Taste of Honey, “The Twist” by Chubby Checker, and “Le Freak (Freak Out)” by Chic. This is in no way an all-inclusive wedding song list, but it does provide an idea as to which songs many people still want to hear at weddings.